The ever growing display garden provides the opportune occasion to view mature cycads in a domesticated environment, also providing us with a comprehensive pollen bank. Our propagation principals sustain pure-bred Encephalartos to ensure the survival of these magnificent plants for future generations. We breed and sell a large variety of Encephalartos species in sizes ranging from seedling to stemmed plants. The ever growing display garden provides the opportune occasion to view mature cycads in a domesticated environment, also providing us with a comprehensive pollen bank. 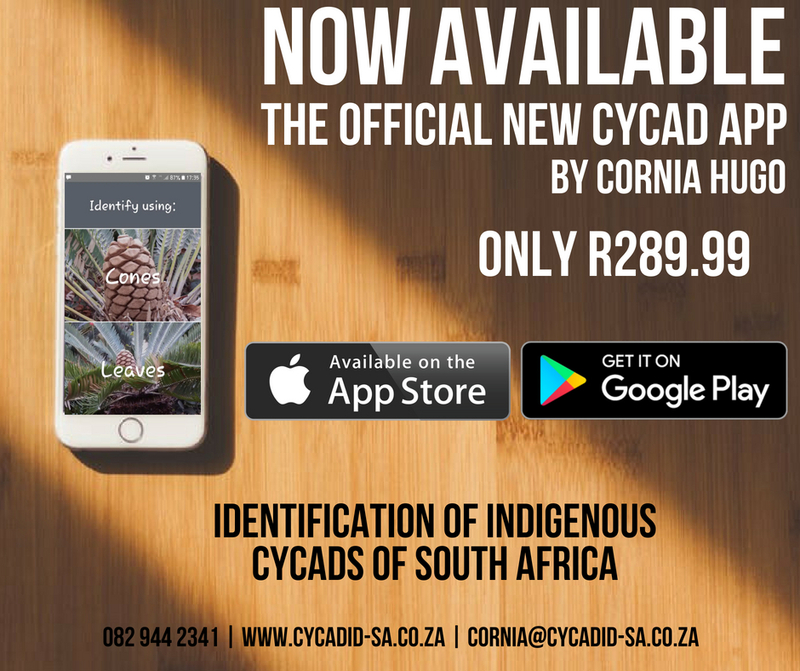 At Exclusive Cycads we are very excited about Cornia Hugo's new mobile app on Cycad Identification! We believe that this tool will go a long way in assisting cycad enthusiasts in identifying cycad species. The purpose of this app is to serve as a practical easy-to-use guide, by using leaves and cones for the identification of indigenous cycad species ( Encephalartos species). App available on Apple Store soon! Exclusive Cycads is here to stay! It has come to our attention that there are rumours doing the rounds that Exclusive Cycads has been sold and that the nursery will close within three years. We want to emphasise that it is only a rumour and not true. In the event of transplanting and uprooting cycads or when removing suckers, the metabolism of the plant is disrupted. Supplements and hormones application in the form of RootStim and GrowStim supports the metabolism and enhance root stimulation due to the high levels of Auxins that speeds up recuperation and reduced stress phase.